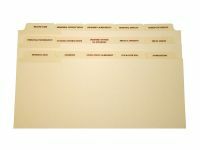 Legal Binders Now carries a full selection of dividers for your estate planning and trust needs. These high quality dividers will stand up to continued use and keep your client's documents organized in their Estate Planning binders. Estate Planning dividers with 15, 17, or 20 tabs are constructed of 90-lb ivory card stock. They are printed with key document subject titles. The tabs have a protective clear mylar coating on the tabs. All dividers are 3-hole punched. Dividers are sold in boxes of 6 sets; minimum order 1 box. See product details for individual and box prices. Irrevocable Trust dividers with 6 or 11 tabs are constructed of 90-lb ivory card stock. They are printed with key document subject titles. The tabs have a protective clear mylar coating on the tabs. All dividers are 3-hole punched. Corporate Organizer dividers with 12 or 15 tabs are constructed of 90-lb ivory card stock. They are printed with key document subject titles. The tabs have a protective clear mylar coating on the tabs. All dividers are 3-hole punched. Retirement Trust dividers with 7 tabs are constructed of 90-lb ivory card stock. They are printed with key document subject titles. The tabs have a protective clear mylar coating on the tabs. All dividers are 3-hole punched. Will dividers with 8 tabs, 1/2 cut, are constructed of 90-lb ivory card stock. They are printed with key document subject titles. The tabs have a protective clear mylar coating on the tabs. All dividers are 3-hole punched.